Part of an over-riding Fashion Details To Die For display, these Floorstand T-Stand Sign Holder Details reveal intricacy of their own. I count 8 right angle bends and a little flip upturn at the hook end for a finishing touch. A unique and interesting approach to outfitting accessory as sign and merchandise displayer. 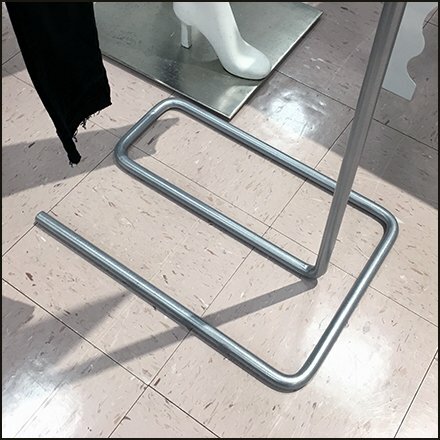 See all twists and turns in the Floorstand T-Stand Sign Holder Details gallery of images. Seen at Bon Ton, Wyoming Valley Mall, Wilkes-Barre PA.